Entering the tatami-mat tearoom-style exhibition spaces at the back of Kyoto’s specialist pewter art craft gallery, Seikado, spectators are apprised that the magnetism of the pieces on display might interfere with the strips on their credit cards. Those fitted with pacemakers are also asked to stand 50 centimeters back from artworks. Despite Sachiko Kodama’s caution, the mesmerizing and meditative aspects of the artist’s small-scale sculptures tempt spectators to come up close. Kodama’s solo exhibition of 10 or so new works is subtitled in French — “Eblouissant,” meaning dazzling. It is an assemblage of the polarities of the plus and minus kinds: liquid and solid, organic and geometric, light and shadow, movement and stasis. After graduating in physics at Hokkaido University, Kodama studied plastic arts and mixed media at the University of Tsukuba from 1993, completing a master’s and doctorate in art and design. 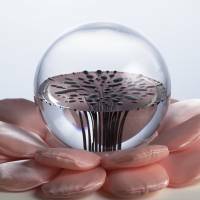 Her signature work, since as early as 2000, has been the exploration of ferrofluids — black particles suspended in a transparent solution. The movements of these particles are controlled by magnetic fields, leading them appearing as the back-and-forth of molten metal congealing, separating and curdling again into complex and attractive, near geometrical, three-dimensional forms. These can be smooth and undulating at one glance, then morph into spiky and piercing protuberances at another. Works like “Ribome #2” (2017) comprise glass ellipsoid bodies containing ferrofluids. Set on mirrors, the forms and their movements seen from above are reflected below. The mirrors also capture the shadows cast from the fluctuating liquids, spotlighted from above. Other types of surfaces (beneath which lie the iron cores and coils creating the magnetic fields) are also used, such as plastic, wood or glass, though metal bases disrupt the magnetism. “Planet #3” (2017) utilizes a pink fabric cut and padded into an arrangement of lotus petals, the form of which has a historical pedigree as a pedestal in some Buddhist statuary. Twenty seconds after works are switched on, Kodama’s slumbering liquids come to life. 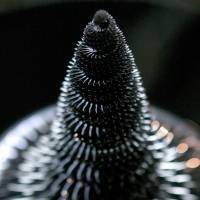 The sculptures should then only be turned off when the ferrofluids are floating on the surface of their suspending mediums and do not spike in a vertical direction. 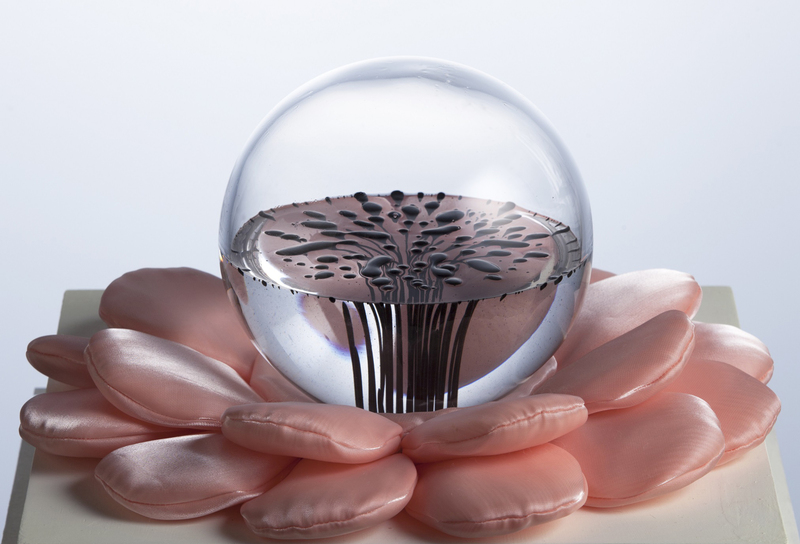 Continual use can result in some of the ferrofluids sticking to the inside of the glass enclosures, while the transparent mediums can also whiten due to changes in temperature and humidity. And because electro-magnets heat up, artworks cannot be left on overnight. Use beyond eight hours is not recommended though a delimitation of enjoying Kodama’s artistic medium anyway depends somewhat on the spectator’s attention span. 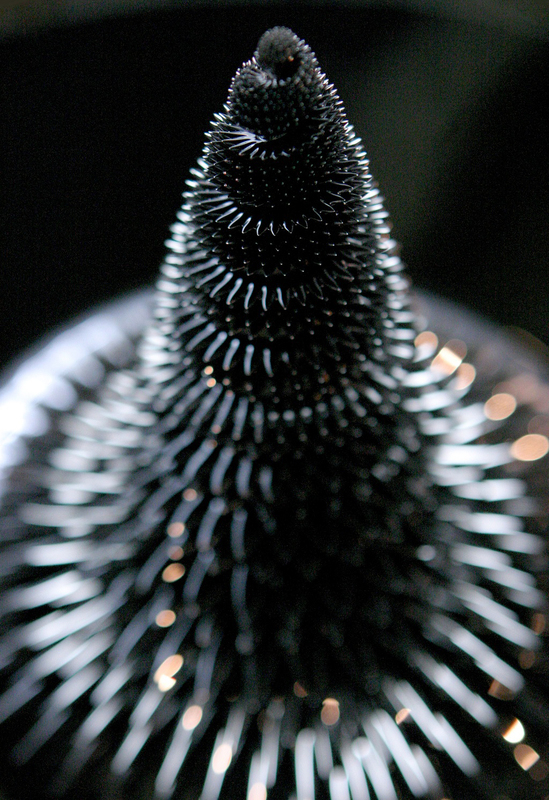 The “Morpho Tower” works have 80 cubic centimeters of the magnetic fluid injected through cone-like towers. The liquids subsequently course up and down and over the spiraling contours of the shafts in an almost thrilling dance-like choreography of spikes that are suddenly sent out and retracted. Generally, the mixing of art and science in contemporary art has resulted in the dilution of both in satisfying or compelling ways. Kodama’s current work exploring the possibilities of an unusual medium, however, positions her near the top of a short list.